Thank you for visiting our newly re-designed web-site. Since 1976 we have striven to become your number one vendor for all your professional business needs. Your trust and loyalty have allowed us to continue serve you with better products with every year that passes by. 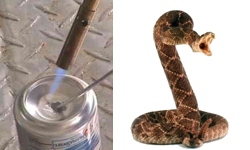 Chickys Wholesalers carries ULTRAFUSE to repair Aluminum, Pot Metal, Galvanized Steel, Magnesium, Brass and Copper. Stay tuned and bookmark us, we are working on adding some more great features to this site in the near future.